£100 non refundable deposit required upon booking. Payment plans available once deposit is paid as long as all is paid 6 weeks prior to holiday start date. £100 refundable security bond to be paid that will be refunded as soon as I have been and checked all is the same as when arrived and there are no damages or excessive cleaning required. 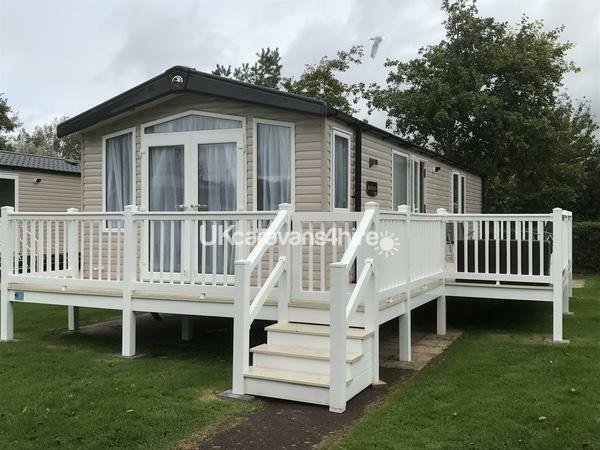 We have a luxurious, brand new, 38 x 12, 2017 Swift Bordeaux Exclusive holiday home with wrap around decking for hire on the desirable Burnham-on-Sea Holiday Village in Somerset. 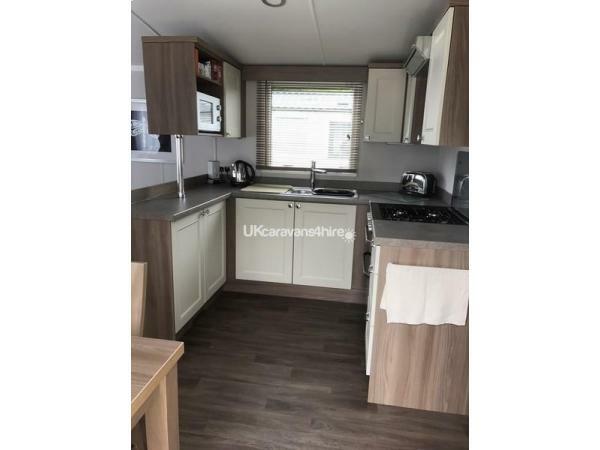 It has an extensive, extra large raised decking to the front and right side of caravan with steps and a secure, lockable gate to keep children safe and prevent them from wandering off, giving parents peace of mind. 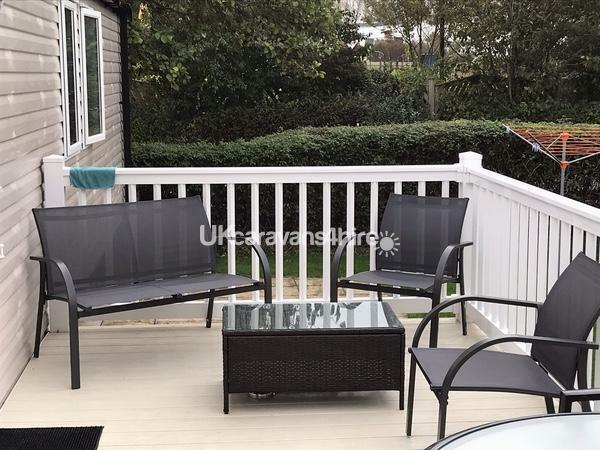 It also features a patio set and comfortable outside lounge seating for you to enjoy in all weathers, along with a separate patio area for BBQs to be enjoyed. 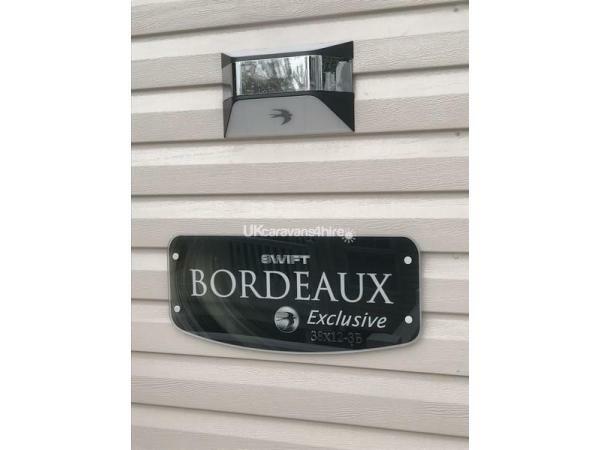 Our caravan is located in Steart Close, a very quiet and private cul-de-sac on this Haven site. 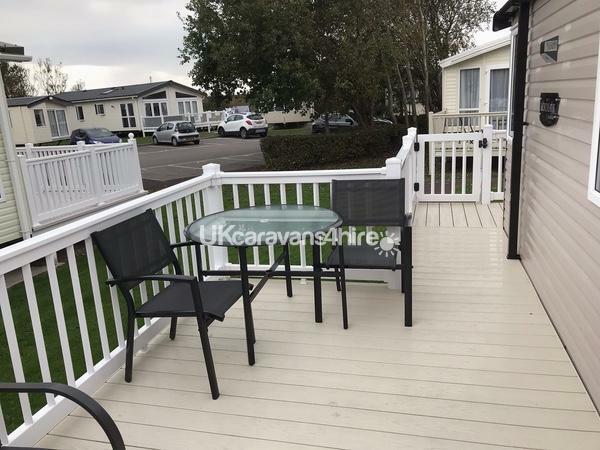 The caravan is only a 2-3 minute walk from the main facilities of Burnham-on-Sea Holiday Village and a 7 minute walk from the local beach and Burnham-on-Sea High Street. We have a strict No Smoking/No Vaping and No Pet policy in our holiday home. 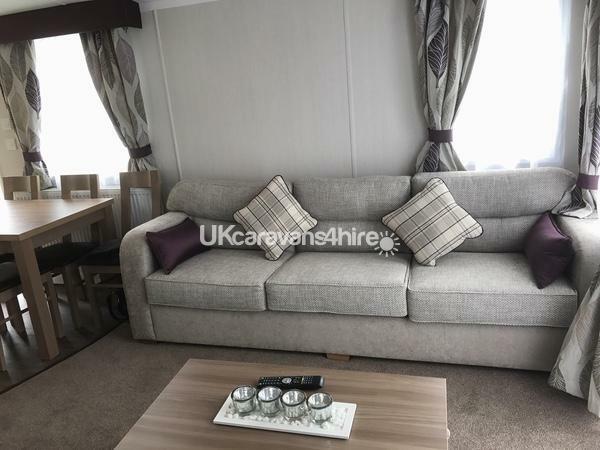 A large spacious lounge with comfortable 3 seater and 2 seater settees, one pulls out into a double bed. 2 foot stools and a coffee table to store them under. It has a 42" TV/DVD and Bluetooth surround sound music system built in to the trendy ceiling speakers. The fire has beautiful artificial flames for those evening that you want to relax, but it is still warm and also has fitted radiators. It features a luxury carpet and French doors that open on to the front raised veranda. A large dining table with seating for six and table mats and table ware provided. A well-equipped, modern kitchen with an integrated full size fridge freezer and a full size gas oven, a hob with overhead extractor fan, microwave oven, kettle, toaster, milk frothier (perfect for coffee or hot chocolate), all pans, crockery, glasses, utensils, children's tableware (beaker, dishes and cutlery for peace of mind) and plenty of space in the cupboard for food storage. Also included is an ironing board and iron for those much needed creases from packing and unpacking. 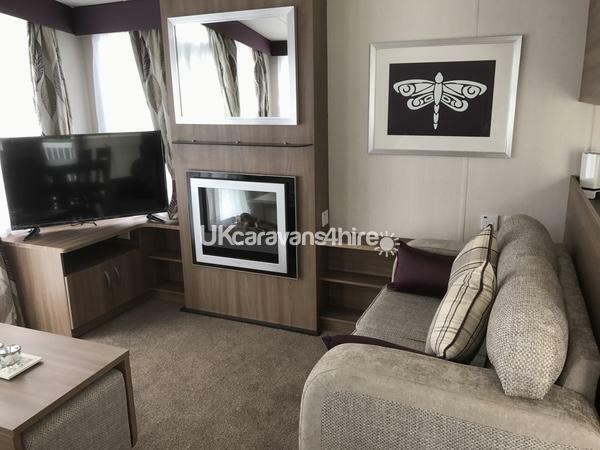 A double bed, duvet and four pillows, flat screen TV/DVD with free view, overhead lighting and bedside lighting, a dressing table with shelves and mirror featuring a lamp for extra lighting with a comfortable stool and a hairdryer that's in large storage cupboard in dressing table area. 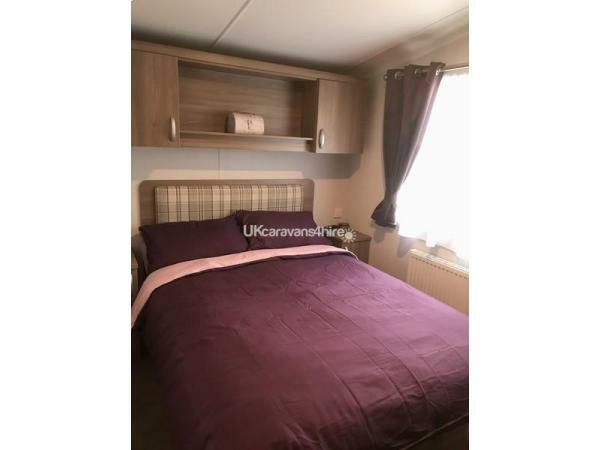 There's also a large double wardrobe with coat hangers and 2 large drawers, bedside cabinets either side of the bed and overhead cupboards and storage. It has an en-suite toilet and hand wash basin with mirror and vanity unit. 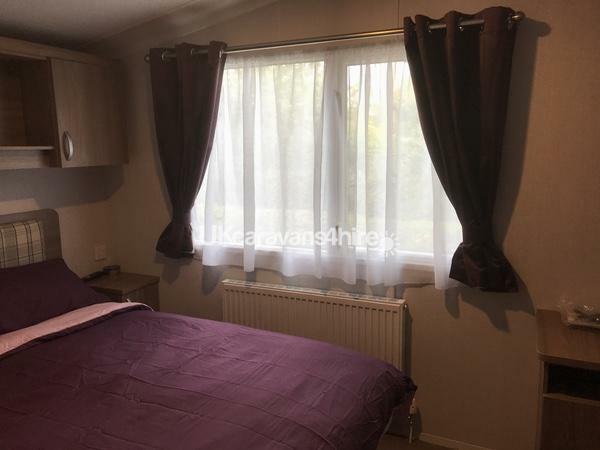 Two twin beds, duvets and pillows, bedside table with over bed lighting and over bed storage cupboard and shelving, and a wall-mounted TV/DVD player with free view. There's also a wardrobe with coat hangers and drawers inside, plus a mirror wall-mounted on the right hand side with a vanity shelf and plug socket. 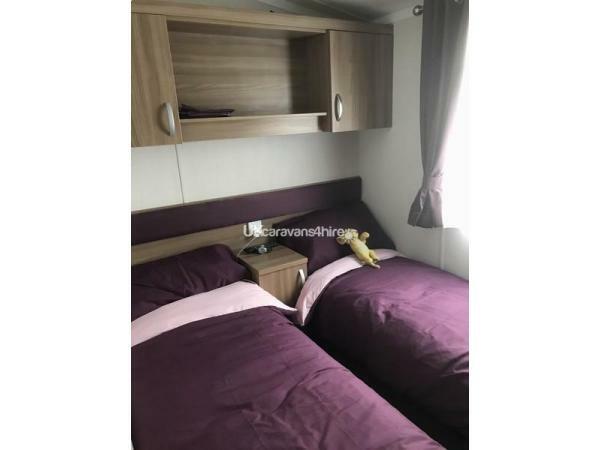 Two twin beds, duvets, pillows, over bed storage units and a bedside table between beds featuring a bedside lamp, tv/dvd combi with free view, a wardrobe with coat hangers and a wall mounted mirror with shelf and overhead lighting. Toilet, large shower enclosure with fully adjustable shower and a hand basin with a vanity mirror with storage unit behind. It also has a pedal bin and a small set of drawers for storage. Numbered, private parking space in cul-de-sac. Your holiday home will be cleaned and prepared for your arrival and we ask that you please leave it as you would like to find it on your departure. You will need to provide your own towels, duvet cover, base sheet and pillow cases. A Non-refundable deposit of £100 is to be paid on booking with the full hire cost payable 6 weeks prior to holiday start date. We do have payment plans available once deposit is paid. This enables you to spread the cost as long as it is paid 6 weeks prior to your holiday. 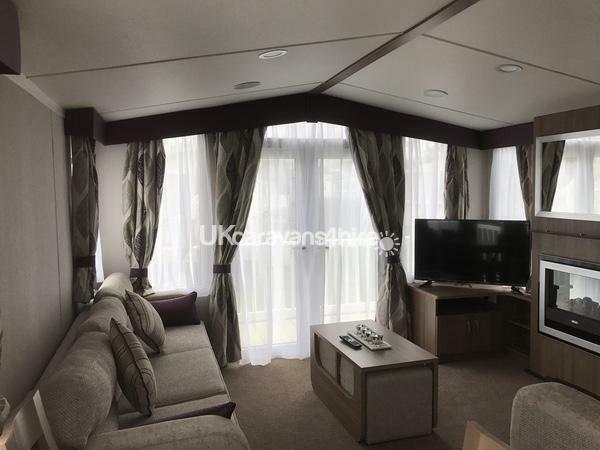 We also require a £100 care and respect bond, which will be refunded within two weeks of the caravan being checked and no damage, loss or the need for excessive cleaning found. However they do cap the prices for full occupancy and it works out a lot cheaper. Beautiful caravan, equipped with everything we could have needed for our stay including children’s cups, plates & dishes. Caravan was spotlessly clean on arrival and even had a few basics like hand soap in the bathrooms. Flexible with arrival time which was great for us as we were only there for the Easter weekend. Caravans location on the site was great, only a short walk to the pool, mini market & the beach. Owner was easy to correspond with and quickly responded to emails etc. We would have no hesitation in recommending to family and friends or returning ourselves in the future.